VISITA GUIADA DEL CENTRE DE CREACIÓ ARTÍSTICA HANGAR PER A ESTUDIANTS DE DIFERENTS ESCOLES D’ARQUITECTURA D’ESPANYA DIJOUS 18 D’OCTUBRE A LES 11H. 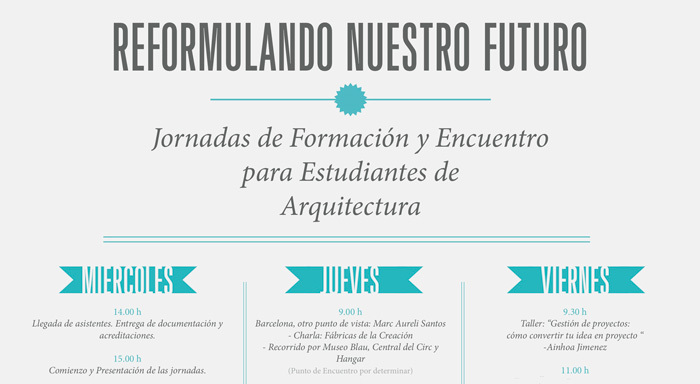 We are participating in the “reformulating our future” training workshops for architecture students. Guided tour of Hangar Artistic Creation Centre for students from different schools of architecture in Spain, thursday 18th october at 11am.